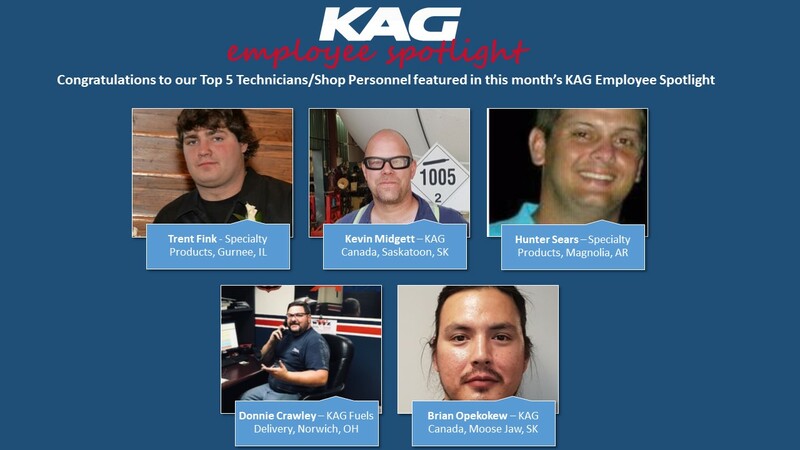 This month’s KAG Employee Spotlight focuses on our talented and highly skilled Technicians/Shop Personnel. Without them, our Drivers would not be in the seat of the best fleet on the road each and every day! We reached out to our Managers across North America asking them to submit nominations for Technicians/Shop Personnel who recently have gone above and beyond their regular work to role model what it’s like to be Technician/Shop employee at KAG. We had an incredible response! And, with over 80 nominations it was very challenging to choose only 5! Congratulations to all the nominees and thank you for all you do! Trent Fink consistently goes above and beyond with regard to safety, preventative maintenance and minimizing costs. In February 2018, we had a devastating fire at the Gurnee terminal. Despite the current situation with the shop’s work environment due to reconstruction, Trent keeps us moving forward to continue serving our customers in a safe, reliable and efficient manner. Trent has worked diligently to keep the terminal in compliance and functioning as normal as possible. We truly appreciate all he does. Kevin Midgett is a Lead Hand with great patience in training new Technicians. Over the last few years he has helped to train multiple apprentices who have successfully achieved a journeypersons status. While mentoring new technicians, Kevin shows them how to work in a safe and efficient manner including the proper use of personal protective equipment (PPE) at all times. Beyond mentoring, Kevin is always willing to provide extra help. He volunteers as one of our winter road Technicians, spending months away from home at our remote shops. In 2016, Kevin worked at our Yellowknife camp to help maintain units that use the ice roads. The past two seasons Kevin worked out of the Lockhart Lake shop where he maintained our units as well as the construction equipment that built and preserved the ice roads. Along with managing personnel and prioritizing tasks, the days of a Shop Manager can be stressful. Team members like Hunter Sears are invaluable. Hunter, our terminal’s Parts Runner, goes above and beyond his job description. KAG was awarded the Albemarle contract in May 2016. Hunter immediately became a vital part of our operations. He manages services, controls inventory, tracks trucks and trailers that have broken down and ensures our Technicians have everything they need to do their job. He always answers his phone to assist with POs and locating vendors. Donnie Crawley’s mechanical career began when he was just 14-years-old. He was a tremendous help to his parents, always working to help out the family when needed. In 1991, he moved from Alabama to Ohio, and he has kept his southern ways that seem to put everyone he meets at ease. His career with KAG began in 1998 with Advantage Tank Lines in Heath, Ohio. After some time away, he came back to Advantage Tank Lines in Norwich, OH when the terminal moved closer to his home. In 2010, Donnie became the shop’s Lead Technician. Donnie plays a very important role in the whole maintenance team (and ATL#20010). Over the past few years, he has written many of the policies that we have put in place in the maintenance department. He ensures that all of our Technicians know the correct way to do their job by following the guidelines he created. And, he randomly checks them to be sure this is happening. Donnie has taken on an integral responsibility of our KAG 20/20 5S initiative. He visits KAG shops to assist with the setup and organization of their 5S. Donnie made a template for each shop to use as a guide to maintaining 5S after the initial implementation. Additionally, he designed a shop schedule with weekly rotating jobs so everyone gets an opportunity to participate in the entire 5S system. Brian Opekokew has enjoyed working on vehicles from a young age. He originally set out to become an automotive technician, but after working with heavy equipment, Brian found a new passion and became a Technician for Westcan Bulk Transport. Brian is motivated to learn and to pass on what he learns to others in his field. He enrolled in the Heavy Equipment Repair program at Saskatchewan Polytech and recently completed his third level of training with excellent scores in all categories. He shares his knowledge with junior technicians by showing them how to complete jobs safely and to never let a unit leave the shop until it is safe for the Driver to use. Brian’s “team-player” attitude is evident in our shop. He is often seen helping other technicians who may be struggling with a task by using his troubleshooting skills. He looks for cost-saving diagnoses so only the parts that need to be replaced will be replaced. Brian communicates well and is very respectful to his team members and management.